Charles Darwin University has signed a Memorandum of Agreement (MOA) with the Laynhapuy Homelands Association of Nhulunbuy to deliver training to the 800 Yolngu people it represents. Paul Fitzsimons, Director of Remote Coordination, said the signing was a turning point for the delivery of remote education in the Territory. The MOA also provides the association with leverage to lobby Government for the funding of four key training facilities, equipped with broadband internet, accommodation for visiting lecturers – located at key sites around Nhulunbuy. 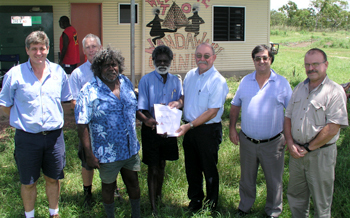 It was signed in the presence of community elders, representatives of the association and CDU at the community of Wandaway, south of Gove. Don Zoellner, Pro Vice-Chancellor, Community and Access, said the MOA prepared communities for changes in governance. Vocational courses offered will include business, local government, health, community services and horticulture – each with literacy and numeracy support.